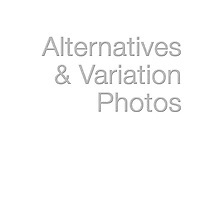 Pictures & images of Aphrodisias archaeological site, Anatolia Turkey & Images of its Roman relief sculptures. Aphrodisias was named after Aphrodite, the Greek goddess of love and the focal point of Aphrodisias was the temple of Aphrodite. Near Aphrodisias are rock deposits of fine white marble which in Hellenistic and Roman times was quarried and used to make fine white buildings and sculptures. 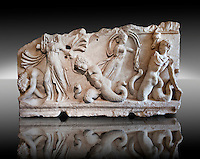 The freezes from the Temple Aphrodite, now in the Aphrodisias Museum, show the highly skilled sculptures that Aphrodisias became famous for in the Ancient world. Leading from the main north-east street of Aphrodisias is a fine Roman tetrapylon, a four way arch placed where streets crossed, built in 200AD. 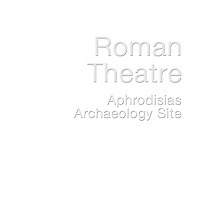 Excavations in 1962 revealed a lavish building program at the centre of Aphrodisias. This building program in Aphrodisias was instigated by Julius Zoilus who was born in Aphrodisias who became a slave of the great Julius Caesar. After Julius Caesar was assassinated he was succeeded by Octavian who became the Emperor Augustus. Julius Zoilus helped Octavian in his succession battle with Mark Anthony and was given his freedom and was endowed with prestige and riches. So Julius Zoilus returned to Aphrodisias a powerful rich freedman and helped turn it into a prosperous and influential city. 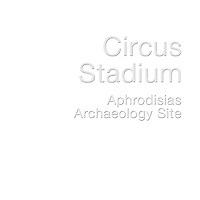 When Christianity became the official religion of the Roman Empire the Temple of Aphrodite in Aphrodisias was turned into a Basilica and in 640 the city was renamed Stauroúpolis ("City of the Cross"). 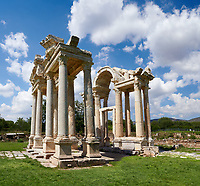 Download pictures & images of Aphrodisias on line or bu Aphrodisias pictures as photo art prints.